Integrated Language Arts Lesson Plans from The Hobbit. Get rid of your pile of workbooks - and enter the world of literature! Curl up on the couch, read a great story to your children; enjoy it! Then, examine what made that book so wonderful, and use it as a model for your own writing! Modeling the Classics is a simple, integrated approach to use literature as the basis of language arts lesson Plans - one book for multi-ages covering all the language arts! One E-book with 200+ pages! Modeling the Classics aims to encourage children to model their own writing, on styles of authors which they already love. Before any writing begins, the whole book should be read aloud to the children. All of these books are loved by children because of their characters, warmth, descriptions, creative plots and the beauty of the literary style. Through each lesson, the children are to be keen observers of the classic author, explore the techniques which the author uses and then use the passage as a model for their own writing. There are five lessons (each lesson is at least 2 weeks work) in Modeling the Classics, Language Arts Lessons from The Hobbit. 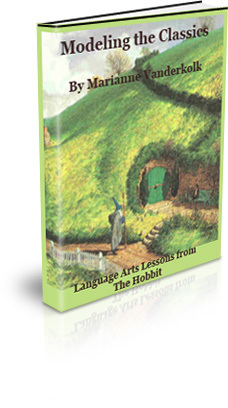 This e-book contains The Hobbit Lesson Plans covering all language arts for ages 7-15.